I have been in touch with some artists in Cornwall asking them about their life in Cornwall and how they are inspired by the Cornish landscape. Lorraine and I and the children moved to Cornwall from Brighton 7 yrs ago. I had resisted the move for many years but finally succumbed. Lorraine was a farmers daughter being brought up on the farm at Godrevy. So my first introduction to Cornwall was Godrevy Lighthouse and that stunning vista over to St Ives. 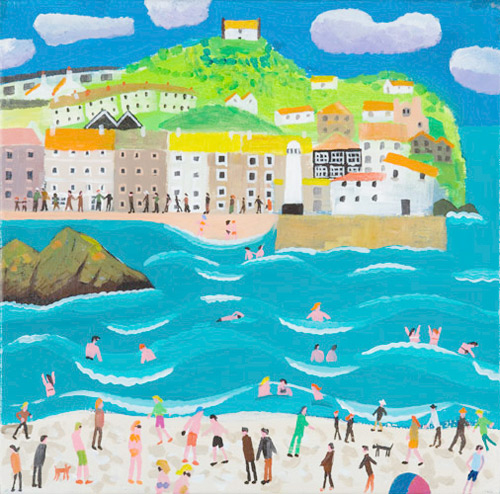 I absolutely loved Cornwall but my business as a professional painter supplying the markets in London just made me feel nervous about moving when the art business is so precarious anyway. We made the move however and now live in Penzance. We have a nice house near the town centre ,swimming pool and beaches so we are in heaven. My studio is in the garage next door and my business has not suffered. 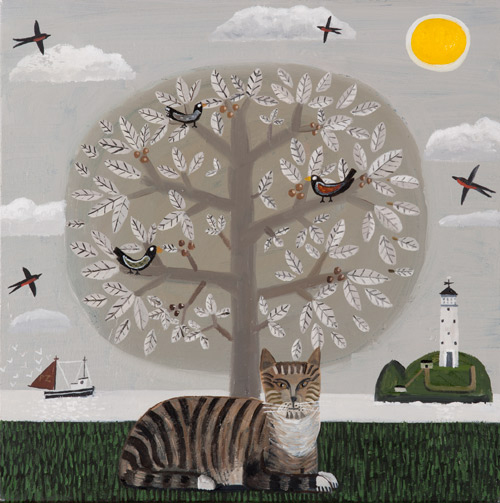 In fact I am constantly asked for paintings of Cornwall, and the funny thing is that image of Godrevy Lighthouse is still a current theme in my work. 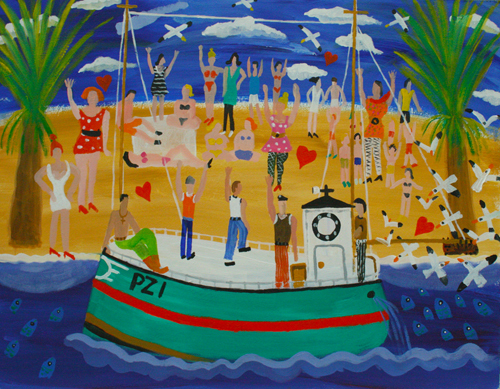 Lorraine works as a CPN and I joined the Association of British Naive Artists. 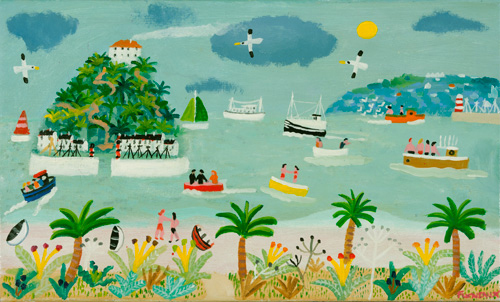 My work is published by many publishers including Marks and Spencers, Unicef and Art Cards Cornwall. Soon after we moved here and with the children settled at School I became seriously ill with a rare condition called Devics which is similar to MS, I was paralyzed and spent 4 months in hospital learning how to walk. I came out in a wheelchair but now am pretty much ok having had only one serious relapse. I live with the prospect of more relapses so my energy goes in creating the very best paintings I can while I am able. I exhibit in some great Galleries including Thompsons in London, David Curzon in Wimbledon and Blackheath Gallery. I have only one outlet here in Marazion at the Market House Gallery a great little gallery which hosts the very best Cornish Artists so I am very proud to be there. 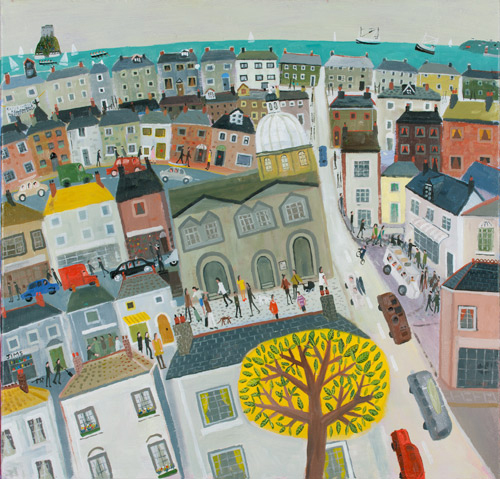 Check out more of Alan’s work on his website www.alanfurneaux.com and follow his blog here. Ive been humming the song he wrote for his wife for the past five minutes but I will let you find that for yourself! An interesting little video on the decline of the pilchard industry. Thankfully since this video was filmed there has been a revival in the pilchard industry in Cornwall. Special thanks to Cornish Voices for putting this together. The Penlee lifeboat was called to assist the crew of the Union Star, a cargo ship on her maiden voyage as she was heading towards the rocks off the Cornish coast on 19th December 1981. The Solomon Browne and its 8 crew from Mousehole were called at around 8.15pm. Trevelyan Richards the Coxswain of the lifeboat got the Solomon Browne alongside the Union Star from where it was thrown several times onto the deck of the cargo ship before sliding off. A Sea King helicopter above the incident was watching but unable to help due to the adverse weather conditions. 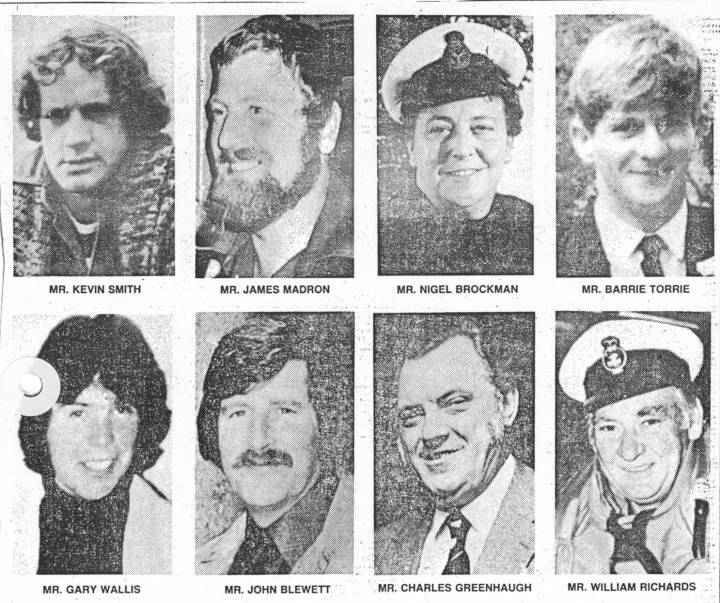 As the pilot of the helicopter looked on he later commented at the inquiry that ‘they were truly the greatest 8 men I have ever seen’. Eventually Trevelyan Richards got the boat alongside the Union Star and got 4 of the 8 crew off the ship and onto the lifeboat. Not content with rescuing the 4, he went back in to save the other 4 lives. At this moment as the Falmouth lifeguards were listening to the radios between the Union Star and the Solomon Browne it all went silent and something terrible had happened. Both boats were so close to the shoreline rocks and they had succumbed to the power of the sea. All 16 people were lost, 8 crew of the Union Star and the brave selfless men of the Solomon Browne. The following day boys and men from Mousehole were stepping forward to replace the crew of the Solomon Browne, one young man who stepped forward was the son of one of the crew who had died the night before. He later became Coxswain of the Penlee Lifeboat. These men are still remembered annually as the lights at Mousehole are dimmed between 8pm and 9pm in memory of their sacrifices. Many a tribute has been paid to these men on the internet and much can be found on the net. However our favourite is a song by Seth Lakeman called Solomon Browne all about that stormy night. …and aptly Seth also played this at the Minack theatre not far from where the lives were lost. Russell Holland has also produced this together with the Cornish Wurzels I believe. The backing singers are the crew of the current Penlee lifeboat. Tonight at 10pm on BBC FOUR is the Cruel Sea: The Penlee Lifeboat Disaster – first screened in 2006, is an account of what happened that night with real radio footage, eye witness reports and memories of the families who lost their loved ones. To find out more about the Penlee Lifeboat visit their website here. Finally to make a donation to the RNLI please click here , its a very worthwhile charity. If you are looking for somewhere to walk off those mince pies after Christmas or in my case before Christmas then take a walk around Kennall Vale. 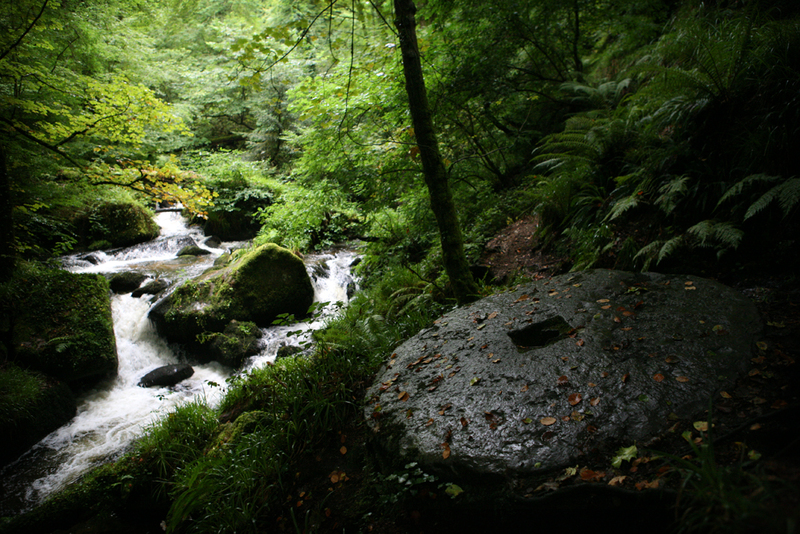 Old mill stone lies next to the River Kennall. Situated between Redruth and Falmouth in the village of Ponsanooth, Kennall Vale is part of Cornwall’s rich heritage from the Tin mining era. Gunpowder was produced here with production starting around 1812. By 1860 some 50 men were employed in the gunpowder ‘factory’ until its closure in the early 1900s when alternative and more sophisticated methods of explosives were used in the Cornish mines. Kennall Vale is now a tranquil and serene place to have a quiet walk and is very popular with dog walkers. The valley has a river (The Kennall!) running through it which would have provided the power to work the machines within the gunpowder mills. Now, just lies the ruins of the old granite buildings and parts of the cast iron wheels which once turned. A walk around Kennel Vale is not for the faint hearted, it starts off with a nice wide even path with a slight gradient going under the canopy of large beech trees, as you walk along you can hear the water running in the nearby river but it’s not until about half a mile before you experience the whole drama of this amazing place. As you pass some old buildings and the old quarry on you left hand side (from where the granite was taken to build all the mills) now filled with water you will turn a corner and the footpath then crosses the river (via a bridge). Take time to stop on the bridge and watch and listen to the incredible power of the water beneath you. As you walk across you will see many waterfalls in front from where the water was channelled down to drive other parts of the mills workings. Take care now along this path as you walk back along the river from the other side. This path is narrow, muddy, slippery, and everything you didn’t want to hear! But it all adds to a fantastic experience, as you wonder back imagining what it must have been like to work in such a place – producing gunpowder too! And yes finally, for those who are interested in any gunpowder incidents which happened at Kennall Vale click on the worldheritagecornwall.com. It’s a great walk, will take an average able-bodied person around 45 minutes – 1 hour to do the circuit and it certainly burn off a few mince pies. – Just remember to leave those cigarettes in the car! I love this image which bizarrely reminds me of my childhood. I must have walked past this gravestone hundreds of times in the past, from going to sunday school, visiting family graves, cutting through the churchyard on the way home from school, going to and from friends homes and now planning our wedding which will be held at the church next year. 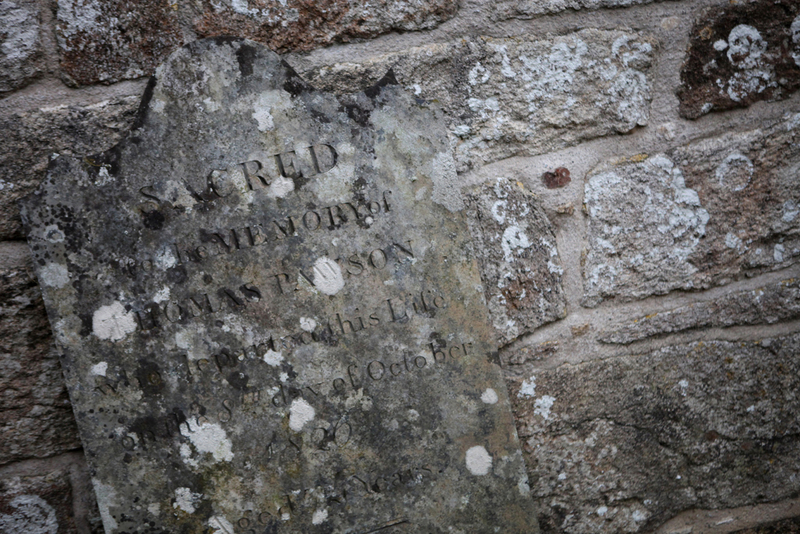 This old grave stone dated 1826 is against the church along with a few others, probably as they have fallen over they are rested against the wall of the church in days gone by. Over the years the lichen has almost camouflaged the slate gravestone against the granite wall of the church making you almost have to look twice at the image. 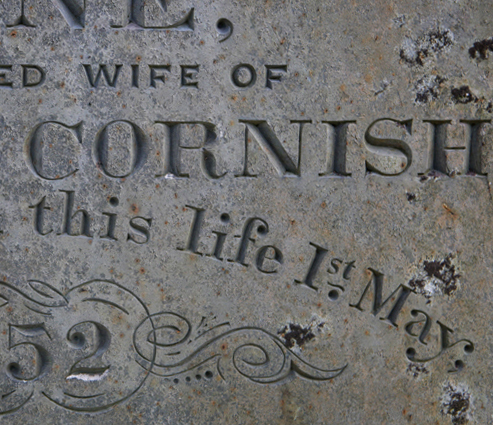 We found this gravestone in a churchyard in Gunwalloe a few months back, it’s a proper Cornish gravestone belonging to Jane and William Cornish. Lovely colours and great textures of Cornwall! An eathquake measuring 2.2 on the richter scale hit the Bodmin area at 2.40am on the 4th December. 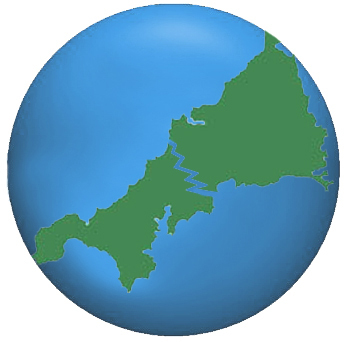 The quake could be felt as far away as St Austell, Liskeard, Camborne, Wadebridge, Callington and Padstow. Thankfully it was only a small tremor and nobody was hurt.